Synthetic sapphire stone is purer than the natural stone. It has uses in watches, clocks, optics, instrumentation, telecommunications and much more. Briefly, to manufacture the synthetic sapphire a mixture of pure sulphate of aluminium and ammonia is dissolved; the resulting product will crystallise as ammonia cal alum. To obtain colours, either oxides or metallic salts are added at this time: Chromium for red, Nickel for yellow. All synthetic sapphire regardless of colour (white, blue, clear and yellow) is called sapphire, except for the colour red, which is called Ruby. This mixture is calcinated at 1200 degrees Celsius, and pure aluminium oxide remains. The final phase of the process, which was invented by Professor Auguste Verneuil, is the fusion and crystallisation of the finely sifted alumina in an oxygen-hydrogen blowpipe. A blow given by a small hammer releases an adjustable quantity of alumina, which is drawn into the flame by the oxygen. 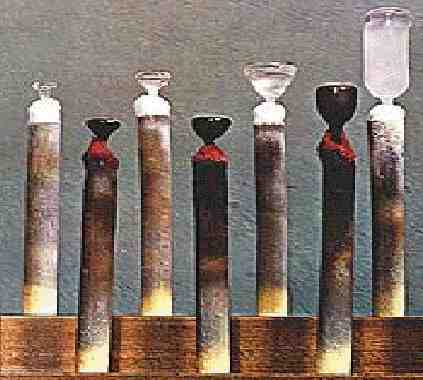 It melts in the hottest part of the flame ( 2,000º C) and Alum is formed which crystallises in successive layers. These layers are known as zones of growth, and the whole is known as a 'boule'. Within 3 to 5 hours the boule will have been allowed to grow to its desired size, it is then split in half along its optical axis.